Typically on asphalt roofing, the vents are covered with shingles, like the line running across the top on this photo. Warm air rises in the attic to the roof peak and comes out that ridge vent. Not many people know about roof ventilation but with good ventilated roof, you can get lower heating and cooling costs while improving your comfort in your home. Sometimes it can even help prolong the life of your roofing shingles. During the summer season, roofing that is ventilated, lets the hot attic air to escape, which in turn makes less work for the air conditioning system to do. Then in the wintertime, ventilation helps keep the roofing cold, so snow doesn't melt on the roofing as much and then refreeze, causing ice dams. Ventilation can help your home practically year-round. Here at Bone Dry Roofing we install and repair ridge vents and other kinds of roof vents. 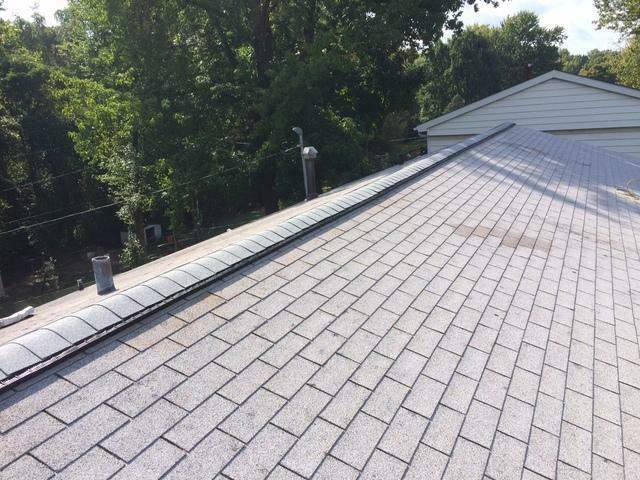 Fore more information contact us to start your FREE estimate for ridge vent installation in Saint Louis, Chesterfield, Saint Charles and throughout Missouri. The specialists at Bone Dry Roofing can help you choose the right type of roof vents for your home. We can repair or install roof vents and improve your attic ventilation. We offer all our professional roofing services throughout Greater Saint Louis, including Saint Louis, Chesterfield, Saint Charles, Saint Peters, Florissant, O'Fallon, Belleville, Ballwin, Wentzville and nearby. Call us at 1-844-778-2185 to get a free quote on any of your roofing needs.